About 30,000 residents were enumerated in Wheeling, West Virginia in the 1880 U.S. federal census. Irish immigrants accounted for about 5% of the population at that point. J.L Stauton was the census enumerator in the first sub-district of the 6th Ward. This section was in the downtown area where Market, Main and 20th Sts. straddle Wheeling Creek as it flows into the Ohio river. As he went about his work, he recorded the county or province of birth for about 55% of Irish immigrants that he enumerated. The 1880 federal census also asked for the place of birth of the person's parents and he also recorded this information. This can be particularly useful if one of the parents is deceased. For example 23 year old Alice Moran, is living with her mother Mary at 31 Main St. Alice is listed as being born in West Virginia, mother born in Kilkenny and father born in Dublin. There is no male of the correct age living with the family so he may be deceased. Despite this possibility, we know what county in Ireland he most likely came from. That is my best effort at interpreting his signature at the top of the census pages. Ancestry.com, 1800 US Census, Ohio County, West Virginia, population schedule, City of Wheeling 1st Supervisors District, Sheet 2B, House 17, family 21, Alice Moran; digital image, Ancestry.com http://www.ancestry.com: accessed 2 February 2015; citing Family History Film 1255410 Roll 1410. The Montreal Emigrant Society was founded in 1831 to provide safe passage, employment, and relief to poor and destitute immigrants from Ireland and Great Britain. They arrived at Montreal after a trans-Atlantic crossing but that was not the final destination for many. The Society helped them on their way to other parts of Canada and also provided temporary accommodation and food. 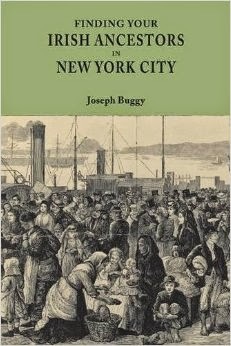 In total, between 1831 and 1835, the society provided assistance to 49,740 immigrants. In 1832, 8,763 received assistance to settle in other parts of Canada. One of the passage books from this year survives and provides information for almost 2,000 immigrants. It covers the dates from 23 May to 1 November. The entries record the names of single adults or heads of families, along with ages of the adults, ages of any children, ticket number, where sent, occupation, and 'where from.' For Irish immigrants, a county of origin is provided. For example, Pat Murphy and his brother traveled on ticket 314 to Cornwall on 13 June 1832. Both were under 14 years of age and were from Armagh. Another entry outlines that Lawrance Ryan and his wife, both aged between 20 and 40, and their three children, one an infant, another aged between 7 and 14, and a third over 14 years, travelled on ticket 841 to Prescott on 21 July 1832. He was a farmer, originally from Cork. You can access the database by clicking here. It is a good idea to read about the records and the database limitations before searching. 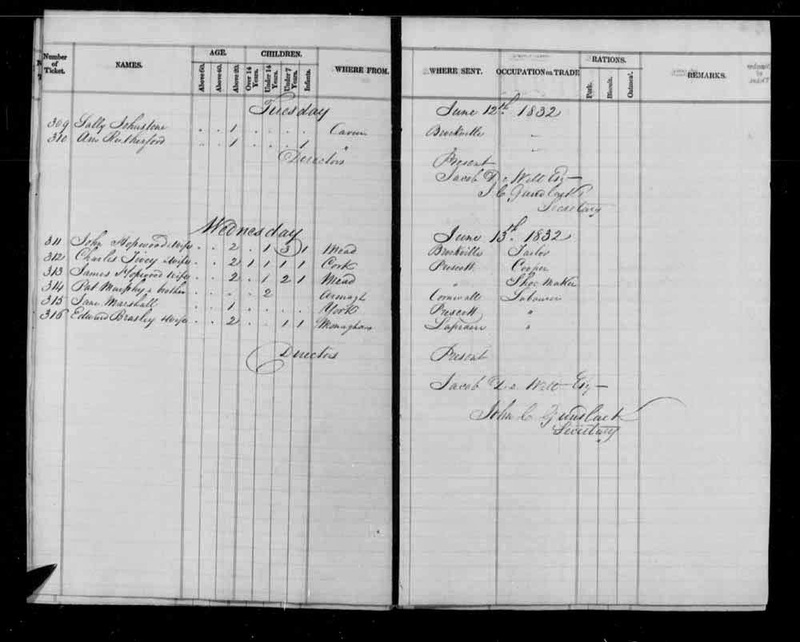 While the ledger pages were scanned, they were seemingly not done so at a high resolution, as can be seen by clicking the image, above. Library and Archives Canada. Immigrants Sponsored by the Montreal Emigrant Society, 1832. 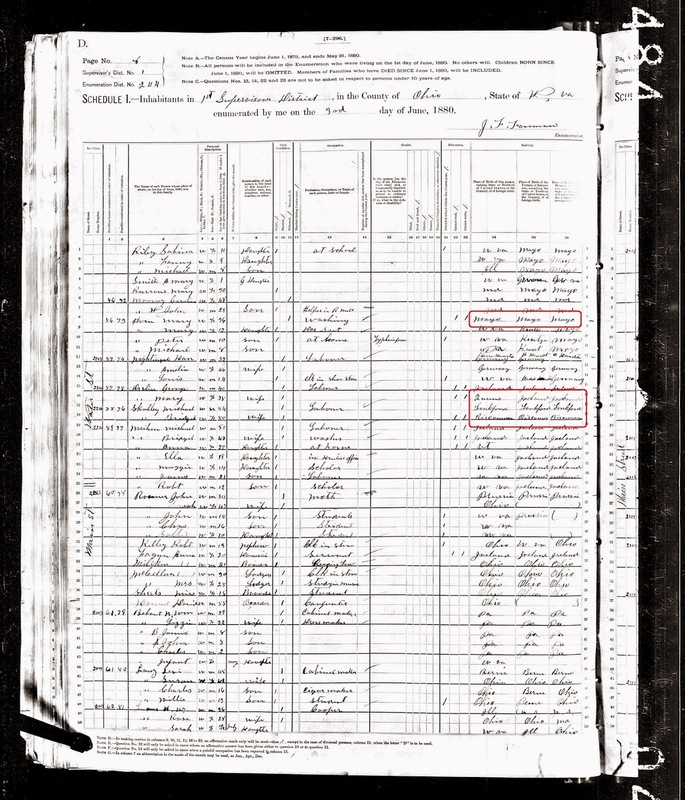 24 April 2014. http://www.bac-lac.gc.ca/eng/discover/immigration/immigration-records/immigrants-montreal-emigrant-society/Pages/introduction.aspx: accessed 10 February 2015. “Immigrants Sponsored by the Montreal Emigrant Society, 1832”, database, Library and Archives Canada (http://www.bac-lac.gc.ca : accessed 10 February 2015), entry for Lawrence Ryan, 21 July 1832; citing Montreal Emigrant Society Passage Book, Microfilm Number H-962, Volume 46, Reference RG7 G18, Item 1654. I've yet to write a Canadian-themed post this year so that will be rectified by discussing the website Bytown.net. Opening the site, we are first greeting with a heading, outlining that it is "a digital history of Eastern Ontario and Western Quebec, Canada, including the cities of Ottawa and Hull / Gatineau, 1600 to 2014." 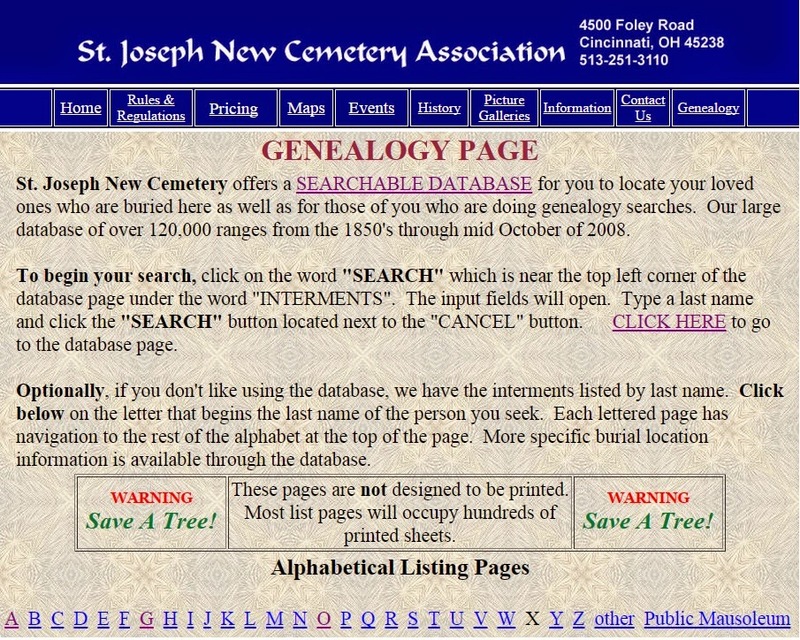 It seems to be something of a Rootsweb type site with a lot of contributors proving all sorts of historical and genealogical information. 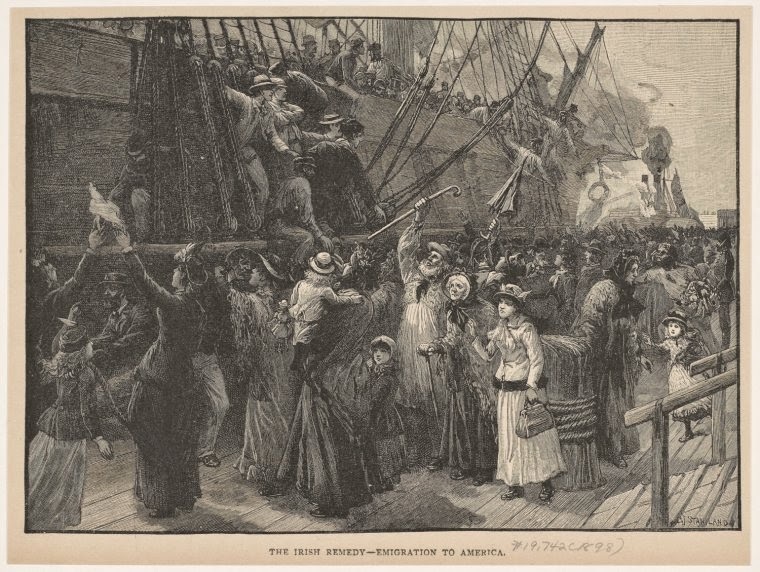 The important thing, though, is that there is a lot of genealogical and historical information on this site about Irish immigrants and their descendants. 'Control+F' will definitely be your friend on Bytown.net. The first page is lengthy, but provides links to other pages on the site that go into more detail. Indeed, on that first page you will find three tables of settlers in the Ottawa area. A significant number of the entries have an Irish county of origin listed and the name of the people can be clicked for more information. The website also has a substantial bibliography of books for many different ethnic groups, including the Irish, in the region and country. If you do have ancestors who once lived in the Ottawa/Eastern Ontario/Western Quebec area, then this site is definitely worth checking out. Access the site by clicking here. Labels: Canada/Ontario, Ottawa, Place of Origin, U.S.A. This dramatic and chaotic picture was created in 1898 by artist Charles Joseph Staniland. The title, The Irish Remedy - Emigration to America, is an overtly political statement and provides a pointed commentary that is sadly still relevant to this day. The crowded nature of the image, dominated by a large ship and masses of people, leaves nobody in doubt as to what the main components of this remedy are. Source: Art and Picture Collection, The New York Public Library. The Irish Remedy - Emigration To America. New York Public Library Digital Collections. 1898.